Heat oven to 350°F. Cook noodles to desired doneness as directed on package. Drain. Meanwhile, in medium bowl, combine spinach, pesto and Alfredo sauce; mix well. Set aside. Heat oil in large skillet over medium-high heat until hot. Add onion; cook and stir 3 to 4 minutes or until almost tender. Add ground chicken; cook 4 to 5 minutes or until no longer pink, stirring frequently. Stir in spaghetti sauce. To assemble lasagna, place 1/3 of sauce mixture in ungreased 13x9-inch (3-quart) glass baking dish. Cover with 3 cooked noodles. Top with half of spinach mixture, then 3 noodles and 1/3 of the sauce. Sprinkle with half of the cheese. Cover with 3 noodles. Top with remaining half of spinach mixture, remaining 3 noodles and remaining 1/3 of sauce. Spray sheet of foil with nonstick cooking spray. Cover baking dish with foil, sprayed side down. Bake at 350°F. for 20 minutes. Uncover; sprinkle with remaining half of cheese. Bake an additional 20 to 25 minutes or until cheese is melted and edges are bubbly. Let stand 10 minutes before serving. 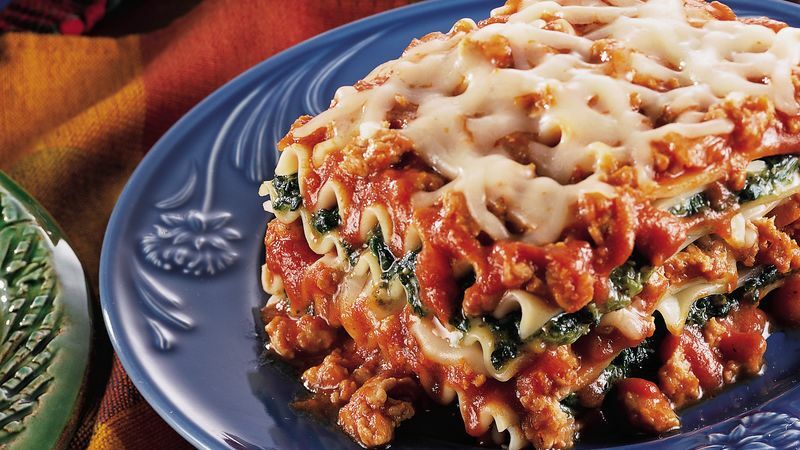 Ground turkey can be used in place of the chicken in this lasagna. To quickly thaw spinach, cut small slit in center of each pouch, microwave each on HIGH for 2 to 3 minutes or until thawed. Prepare and bake lasagna, cover and refrigerate for up to 1 day. To reheat, spray a piece of aluminum foil with nonstick cooking spray and cover pan lightly with foil. Heat in a 350°F. oven until hot, about 20 to 30 minutes. Serve this hearty chicken lasagna with a tossed green salad that includes your favorite chopped vegetables such as tomatoes and cucumbers. Add sliced garlic bread to complete the menu.